Yesterday I was in the mood for Italian sausage, peppers and onions. 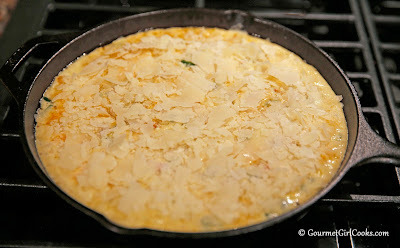 I thought about serving it over zoodles...but decided instead to simply whip it up into a frittata. It turned out amazing and included all the same delicious ingredients and flavor. 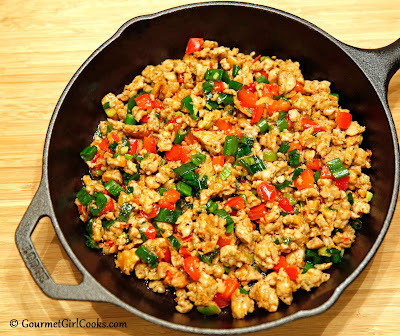 I simply removed mild Italian sausage from its casings and browned it up in my cast iron skillet along with onions and red bell peppers (I used green spring onions, but regular diced onions would be great, too). After browning everything in olive oil and seasoning it with a pinch of red pepper flakes, I beat eggs, cream and finely grated Parmesan together, then stirred in some shredded mozzarella and poured that over the sausage peppers and onions mixture, stirring it around a bit to evenly disperse the eggs throughout the sausage mixture. I topped it with large flakes of Parmesan and popped it in the oven to bake for about 30 minutes. It came out nice and golden brown. It was an easy and delicious one skillet meal and a great way to enjoy an old favorite. I snapped a few photos below and included the easy peasy recipe. Enjoy! 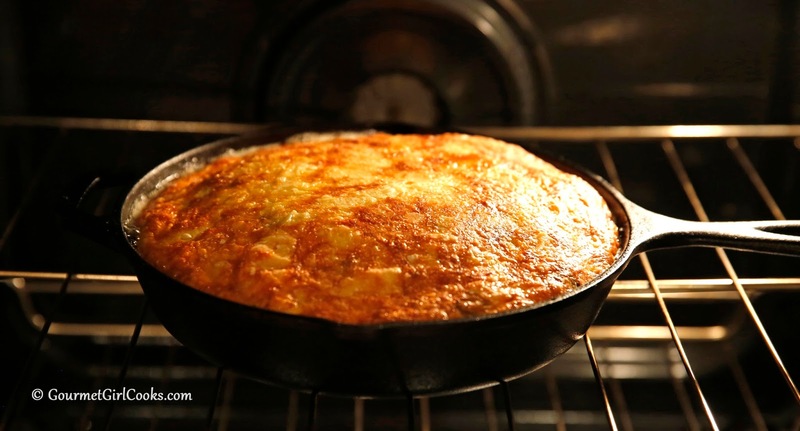 Preheat oven to 375 degrees F. Heat 2 tablespoons olive oil in an oven proof 10-inch Lodge cast iron or nonstick ovenproof skillet over medium-high heat. Add sausage and cook, breaking up as it browns until no pink remains. Add red bell pepper and continue cooking until peppers are tender-crisp, about 5 minutes; stir in green onions and red pepper flakes; cook another 2 minutes (if using a regular onion, add onions along with red bell pepper). Remove from heat and set aside. In a large bowl, whisk eggs and cream together. Stir in grated Parmesan cheese and mozzarella; season with salt and pepper, to taste. Return skillet with sausage mixture to stove over medium heat. Pour egg mixture over sausage in skillet, stir gently to combine; and cook for 2 to 3 minutes to hasten crust formation and help keep it from sticking to the pan. Top with remaining 1/4 cup shredded or flaked Parmesan cheese. Bake for approximately 30 minutes or until puffed and golden brown. 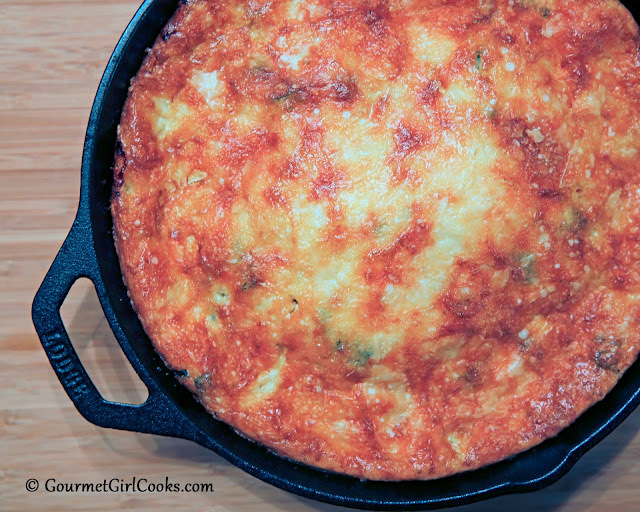 Just cooked your Fritatta tonight and my husband's response was "Very tasty"! Going to try this this evening ! I made this for dinner last night and my husband thoroughly enjoyed it (As did I). I had also made a batch of your buttermilk biscuits and together I had a wonderful dinner. And I found out this morning that the frittata is even better the next day. You are making my grain free journey so much easier. Thank you so much for the recipes. Made these in muffin cups, so good for breakfast on the run! Great idea to make them easily portable Traci. So happy you enjoyed them!